The agate is carved in a late Roman style, of around AD 400, but is probably 19th century. The mounts, in the style of the Italian Renaissance goldsmith, Benvenuto Cellini, were made in London before 1834. Acquired as a genuine Renaissance treasure by Baron Ferdinand in 1897, the vase was a centrepiece of his displays in the New Smoking Room at Waddesdon. Two-handled vase; honey-coloured agate; enamelled gold mounts and cover; oviform body cut in cameo with vine branches and grapes; Pan-headed handles; acanthus leaves at base; convex cover, chased in relief with four opaque white satyrs with outstretched arms holding grapes; knob in form of cluster of grapes and leaves, enamelled in translucent green and ruby; flat underside engraved with trefoil design of branches enclosing birds and insects, filled with translucent enamel; mouth mount divided into three zones: upper, representing wreath of grapes and leaves with ruby-coloured band; below lip, broad band with formal scrolls in white on black ground relieved with gold; foot formed of four rams' heads, each with four horns, resting on short stem with vertical flutes in blue, lower member with egg-like bosses of white enamel; square plinth, engraved and enamelled with floral scrolls; horned mask with leafy beard at each corner; sunk panel of reclining Bacchus in relief on each side, in white enamel; on each side, rectangular fret in blue enamel enclosing a vase in ruby red. Openwork. (i) Carved agate: authenticity is uncertain; since 1899 loosely described as “antique Roman” or “antique”, but recently attributed to the late Roman period, c. AD 400. (ii) Enamelled gold mounts and cover: previously described as “Italian, 16th century” and, subsequently, attributed to Benvenuto Cellini (1500-71) but now attributed to the hand of an early 19th-century copyist - before 1834 - perhaps working in London. Provenance: Formerly in the collection of the Dukes of Devonshire; recorded in a manuscript “Inventory of Curiosities and Articles of Vertu at Devonshire House, 1834”; also listed under the heading of “Vases of Stones” in the 1892 inventory of Devonshire House, London; lent by the 8th Duke of Devonshire to the Burlington Fine Arts Club Exhibition of European Enamels, 1897; acquired by Baron Ferdinand Rothschild about one year before his death in December 1898, and visible in a photograph of one of the vitrines in the Smoking-Room at Waddesdon Manor towards the end of his privately printed ‘Red Book’, the Foreword of which is dated 1 November 1897 (see also WB.69 - WB.72, all acquired at the same time from the same source). Commentary: The preceding account of the technical construction of the vase has revealed many features that are inconsistent with the known practice of sixteenth-century goldsmiths' workshops, and so the former dating of the goldsmiths' work on this vase to the mid-sixteenth century is no longer sustainable (see below). Most importantly, detailed analysis of the technical construction has revealed that the neck-mounts could not have been riveted into place until after the metal disc had been inserted into the vase and, therefore, the stem and foot elements can only be of the same period of manufacture as the neck-mounts and cover. 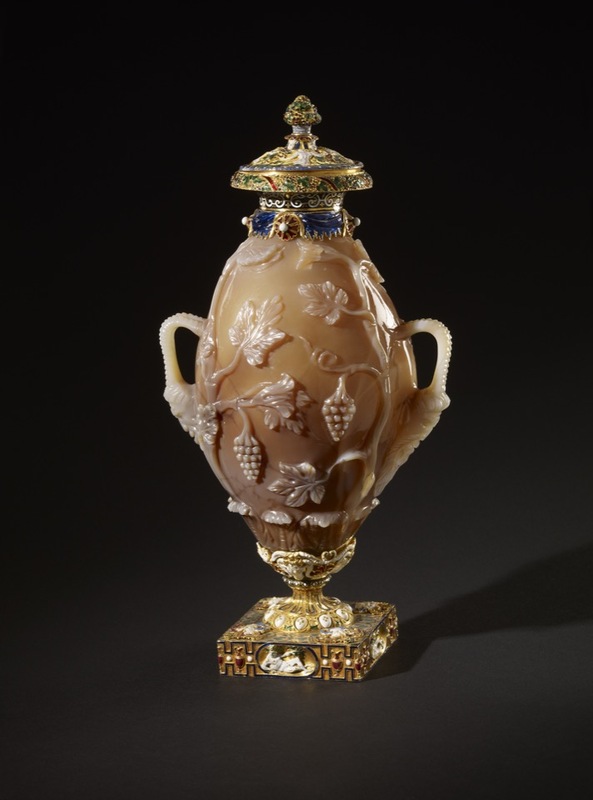 When the vase was first published in 1897, it was described as “Italian, 16th century”, and one of the first suggestions that the carved 'chalcedony' body of the vase had a different origin - namely, “Graeco-Roman” - appeared in Davenport 1900. However, in Read 1902 the 'agate' vase was said to be “antique Roman” and the mounts were, again, described as “Italian, 16th century”; this distinction was repeated in Mrs Eugene Strong's entry in the Chatsworth ‘Catalogue of the Gems’ in 1909. Not until Dalton 1927 was the attribution cautiously altered to read: “The vase, antique; the mounts, Italian 16th century, perhaps the work of Cellini.” This highly significant addition was apparently based on a lengthy comparative study with the famous and fully documented Cellini salt-cellar of 1543 in the Hapsburg Collection in Vienna. Read's manuscript notes, following his visit to Vienna in 1912, are the earliest record of this new line of research, which was to receive the wholehearted approval of Ernst Kris during his visit to the British Museum in 1926, as Kris himself later confirmed in his full-scale publication of the Cellini salt-cellar in 1932, when he restated that the mounts of the Waddesdon Bequest agate vase were the work of Cellini. This attribution, accepted as “very plausible” by Pope-Hennessy in 1949, was quoted by Camesasca in 1955 and by Hayward in 1962; it was not challenged until October 1971, when the author was invited by The Society for Renaissance Studies (Warburg Institute) to lecture on 'Cellini the Goldsmith and his Trattato dell' Oreficeria' (at the Victoria and Albert Museum) and was able to contrast not only the technical features with those of the Vienna salt-cellar but also the character of the enamelled ornament with that on several documented examples, in particular the famous mounted onyx jug which the French King, Charles IX, presented to Archduke Ferdinand of Tyrol in 1570 and which has since remained unaltered in the Hapsburg Collection. Ten years later, in 1981, the author was able to publish for the first time two coloured drawings of the Waddesdon Bequest 'Cellini' vase, both of which recorded several crucial details on the enamelled gold mounts that differed from the object as it exists today, thereby reinforcing the arguments advanced in 1971 for not only disputing this attribution to Cellini but also for questioning the reputed sixteenth-century origin of the gold mounts and proposing an early nineteenth-century origin as the more convincing alternative solution. In the recent monumental monograph on Cellini (see J. Pope-Hennessy, ‘Cellini’, London, 1985) there is no longer any reference to the Waddesdon Bequest agate vase. The reason why the enamelled gold mounts on the agate vase in the Waddesdon Bequest had been so highly regarded by scholars like Ernst Kris is that their external appearance is closely based on a genuine Renaissance original, which is now lost but is, fortunately, recorded in the earlier of the two drawings first published in Tait 1981 (figs 37-8) - the pen and watercolour drawing on paper preserved in the collections of the Dukes of Devonshire at Chatsworth since the mid-eighteenth century. The large album, in which it appears (on folio 24, mounted along with four other eighteenth-century drawings) is labelled 'Lord and Lady Burlington's Drawings'. The album, which is quarter-leather with marbled-paper covered boards dating from about 1810 to 1830, contains a large group of drawings by William Kent as well as a miscellaneous collection of drawings, all of which date from the first half of the eighteenth century, and it seems very probable that they were brought together during the lifetime of Richard, 3rd Earl of Burlington (1695-1753), the creator of Burlington House, Piccadilly, and of Chiswick House, and patron of the architect William Kent. Lord Burlington had brought him back from Italy in 1719 and installed him in Burlington House, which became his home for the remainder of his life; he died there in 1748. When Lord Burlington died in 1753 his spectacular collection of architectural drawings (together with the rest of his magnificent collections, mostly kept at Chiswick House) joined those at Chatsworth, because five years earlier his daughter and heiress, Charlotte, had been married to the 4th Duke of Devonshire. At Chatsworth today this drawing of the mounted agate vase is without parallel; the lack of comparable material in that vast historic collection is a curious fact. The drawing itself has been slightly damaged by folding at some time (before it was placed in the album), and, on the reverse, in the top left-hand corner there remains (upside down) an inscribed capital A with a cut-off flourish - similar to that in the inscription on the obverse. The drawing has been trimmed so close that, on the obverse, at the top the tip of the finial has just escaped but, at the bottom, part of the flourish at the beginning of the French inscription has been lost although the two words are themselves perfectly preserved: Agathe Oriental. Although the caption seems, therefore, to indicate a French origin for the drawing, perhaps in the late seventeenth or early eighteenth century, the evidence remains far from conclusive. There is, however, no reason to doubt, firstly, that the drawing pre-dates the death of Lord Burlington in 1753 and, secondly, that it is not a sketch or design for a proposed commission but is a factual drawing of an existing object, recording as accurately as possible all the salient details, like an illustration in a pictorial inventory. Its value as a document is, without doubt, immeasurably greater than its merit as a work of art - and for that reason it is perhaps puzzling that it should have been acquired for the collection of 'Lord and Lady Burlington', unless it had, indeed, been sent to Lord Burlington or William Kent as a visual record of an object that could be purchased through some dealer and, years later, the drawing had been incorporated with William Kent's drawings and all the other miscellanea in Chiswick House. Significantly, William Kent, who was buried in Lord Burlington's vault in Chiswick Church, had bequeathed to Lord Burlington “two yellow Marble Vases with Vine Leaves” (see E. Croft-Murray, ‘Decorative Painting in England, 1537-1837, II, The Eighteenth and Early Nineteenth Centuries’, London, 1970, p. 232, where the will is stated to have been made on 13 October 1743, and in a codicil two similar vases were also bequeathed to Lord Burlington). It seems, therefore, that William Kent may, indeed, have been the owner of this drawing. Strangely, the connection between the drawing and the agate vase had not been made before 1981. Although the vase had been lent by the 8th Duke of Devonshire to the Burlington Fine Arts Club Exhibition in 1897, neither the drawing nor any reference to it appeared in the full-scale Catalogue of the exhibition. Similarly, it seems not to have been mentioned to Baron Ferdinand at the time of the sale of the vase immediately following the closure of the exhibition. However, earlier in the century the records of the Devonshire Collection are so worded that it may be deduced that the existence of the drawing was well known and its relationship to the vase fully appreciated, especially by the 6th Duke (born 1790, inheriting title in 1811, died 1856). It is, for example, more than a coincidence that in the 1834 'Inventory of Curiosities and Articles of Vertu at Devonshire House' this vase was described - quite unbelievably - as: “A fine Oriental Vase, engraved and raised Vine borders with handles Satyrs' heads, and richly mounted in Gold and Enamel.” The unique use within this Inventory of the word 'Oriental' is most unexpected because although there are many other agates listed none is similarly described. Furthermore, none of the entries describe the origin or age of any of the 196 hardstone objects. Instead, the emphasis was consistently on recording the type of mineral and the form of the object, with perhaps a brief mention of additions, such as the surface decoration or metal mounts. This pattern was established with the first entry of the Inventory: “A Chrystal Boat-shaped Cup; Engraved a Fight of Sea Monsters, Gilt Silver foot”. The 6th Duke, as a young man in his twenties, was noted for his enthusiasm for hardstones and mineralogical specimens, as indeed the numerous entries of the 1834 Inventory fully confirm; they even include three items (“a Spar Pillar, Blue John” and “2 White Spar Pillars”), which according to the annotation (in a different hand) were “taken by His Grace to Paris 2 Jany, 1836”. Blue John is the finest-quality fluorspar, being deep purple in colour, and was found in its greatest perfection in Derbyshire (not far from Chatsworth), but the supply was completely exhausted before the end of the nineteenth century. Although many of the items listed in 1834 were finished objects, highly polished and richly mounted, others were little more than mineralogical specimens that received the briefest of descriptions: “polished pebble”, “7 agate polished specimens”, “1 Topaz Pebble (or Nova Mina)”, “A Lump of polished Red Agate” and “A piece of black and white speckled Porphyry”. In such a context the entry describing the Waddesdon Bequest vase is conspicuous for being the only one that omits the name of the material from which it had been made - just as it is unique in appearing to give its origin. The curious form of words – “A fine Oriental vase . . .” - seems, therefore, to reflect the compiler's knowledge of the drawing inscribed ‘Agathe Oriental’ and perhaps, in a moment of carelessness or inattention during dictation, the crucial word ‘Agathe’ (agate) was omitted by the clerk. In the absence of any mention of this piece in the 1811 Inventory of Devonshire House or in any of the pre-1834 records at Chiswick House or Chatsworth, it may be assumed that the 6th Duke was responsible for the acquisition of the vase and for recognising its close relationship with the drawing entitled ‘Agathe Oriental’. The term ‘Agathe Oriental’, or ‘Agathe d'Orient’, seems to have been frequently used by the compilers of French seventeenth-century inventories, probably to denote the exceptional quality of the stone. The most fully documented example to have survived from Louis XIV's collection - albeit without its gemstones, gold foot and central mount - is now in the Galerie d'Apollon, Musée du Louvre (inv. no. OA. 8; Marquet de Vasselot, Paris, 1914, no. 1015; also Marquet de Vasselot, A propos de quelques gemmes des anciennes collections de la Couronne, in ‘Congrès d'Histoire de I'Art organisé par la Societe de I'Histoire de I'Art français, Paris 1921: Compte-rendu analytique’, Paris, 1922, pp. 192-4; more recently, the hardstone of this curious vessel, reclassified as sardonyx, has been compared with a Byzantine example dating from the ninth to the eleventh centuries AD in the Treasury of San Marco, Venice, although it is acknowledged that the surface carving on the exterior of the bowl was executed in France in the mid-sixteenth century when the gold mounts and foot were added - see D. Alcouffe, ‘The Treasury of San Marco, Venice’, ed. D. Buckton, exh. cat., Milan, 1984, p. 157, fig. 15a). This most extraordinary vessel was purchased by the King in 1685 - twenty-four years after the death of its former illustrious owner, Cardinal Mazarin, in whose posthumous inventory of 1661 it is described as: “Un grand vaze dont le corps est d'une seulle agathe d'Orient travaillée à godrons . . .” That lengthy description (quoted in extenso in D. Alcouffe, The Collection of Cardinal Mazarin’s Gems, ‘Burlington Magazine’, CXVI, 1974, p. 521, Mazarin inv. no. 324, fig. 20) continues with a detailed record of the enamelled gold mounts that were set with numerous precious stones (rubies, diamonds, emeralds, etc.) and concludes with the weight - all of which corresponds exactly with the annotated water-colour sketch that had been prepared and sent to Louis XIV from Germany at the time of the negotiations for its sale. The sketch is numbered '17' and inscribed in ink: ‘Vaze d'Agathe orientalle’ (at the top) and ‘Envoyé de Francfort le 28 Avril 1685’ (at the bottom of the sheet), together with numerous smaller annotations relating to the composition of various details on the vase (preserved in the Cabinet des Estampes, Bibliothèque Nationale, no. Lf3, pl. 17; H.O, 394, L.O, 203; see J. Adhémar, in ‘Collections de Louis XIV: dessins, albums, manuscrits’, exh. cat., Paris, 1977, p. 326, no. 350, with illus.). The sketch, which is stated to have belonged to the “agence royale Robert de Cotte” (no. 1919 of the MS inventory of the drawings, etc., in Monsieur de Cotte's possession) and to have been acquired in 1811, is catalogued as an anonymous French work of the seventeenth century and provides additional support for the tentative attribution of the Chatsworth drawing, also inscribed ‘Agathe Oriental’, to a French hand in the second half of the seventeenth century. Significantly, the Royal Accounts (‘les Comptes’) of Louis XIV mention not only a payment on 27 March 1685 of 4,800 livres to Sr. Alvary for this “grand vase d’agate onix garni d'or . . . qu'il a acheté pour le service de S.M.”, but also several similar agate vessels in the same year - all coming from Germany. It is, therefore, probable that these vessels would have been similarly sketched and that, for some reason, another of these drawings, also made about the same time, was later brought to England, where it eventually came to rest in the album of 'Lord and Lady Burlington's Drawings' at Chatsworth. Without doubt, the 6th Duke would have discovered the drawing within a few years of inheriting the title at the age of twenty-one in 1811. He lost no time in exploring the vast hidden areas of his inheritance, shunning the world of politics and even that of the Court, despite being a close friend of the Prince Regent, later George IV. The King made him Knight of the Garter and chose him as his representative at the Coronation of Tsar Nicholas in 1826, but three years later he resigned the office of Lord Chamberlain within ten months of being appointed. He was a lifelong bachelor and devoted much of his time during some forty-seven years to enriching the library and collections and to expanding the gardens and buildings, for he clearly had developed a deeply personal attachment for Chatsworth - a love that he strove to share with as many as possible, keeping the house and grounds open to the public from 10 a.m. to 5 p.m. (see F. W. Thompson, ‘A History of Chatsworth’, London, 1949). His early re-organisation of the collections of drawings is well documented and, indeed, he removed “nearly one thousand original sketches” from their albums and had them hung for all to see in “the Gallery leading to the Chapel” (see Stephen Glover, ‘The Peak Guide’, Derby, 1830, p. 27). By 1835 he had improved the display of the drawings for the unexpectedly large numbers of visitors within the newly created 'Sketch Galleries', where (in his own words) “I have classed them according to the several schools of painting; but I am sure that the arrangement must be very imperfect . . . Few things at Chatsworth are more admired . . . They hardly ever saw the light in my Father's time, nor in mine often, till I rescued them from portfolios, and placed them framed in the South Gallery below” (‘Handbook to Chatsworth and Hardwick’, written (and privately printed) by William George Spencer Cavendish, 6th Duke of Devonshire, 1845, pp. 34-6). Undoubtedly, this coloured drawing inscribed ‘Agathe Oriental’ would have attracted his attention not only because, as a collector, he was noted for his connoisseurship of hardstones, engraved gems and, later, of marble sculpture, but also because it is so conspicuously unlike any of the other drawings in the collection. Searches in the archives at Chatsworth and in London have not discovered papers that chronicle how or when the 6th Duke acquired the matching vase - presumably after 1811 and certainly before 1834. Since few, if any, persons outside the Duke's personal staff and circle of close friends would have known of the existence of the drawing inscribed Agathe Oriental, it seems incredible that the vase itself should almost simultaneously become available and be offered to the Duke, the one person most likely to recognise it and appreciate its connection with the coloured drawing at Chatsworth. If he did record the details of the acquisition of this vase and, perhaps, some details of its previous history, then that information was neither incorporated in the 1834 Inventory - nor in the 1892 Inventory of Devonshire House, where the vase was valued at £650. This later Inventory was made after the death of the 7th Duke and lists the contents of the rooms in the House before itemising the Plate, the Gold Boxes and, then, the 'Vases of Stones'. In both Inventories the five vases that were later to be lent by the 8th Duke to the public exhibition of 1897 had been listed in an unbroken sequence, and, interestingly, all five were kept together when they were sold to Baron Ferdinand Rothschild. The other four (WB.69 – WB.72) are, in the author's opinion, each demonstrably equipped with new mounts of gem-set and enamelled gold - all apparently dating from between 1811 and 1834. The same appears to be true of the so-called 'Cellini' Waddesdon vase. (i) On the square foot (as depicted in the drawing) the two 'classical' vases on either side to the oval niche do not have handles - unlike those on the gold mount itself. (ii) On the square foot (as depicted in the drawing) the two 'half-spaces' at either end are left empty - unlike those on the gold version, where the 'half-space' is slightly increased and accommodates one half of a 'classical' vase, again complete with handle. Because each half is adjacent - but at right angles - to an identical half on the adjoining side, the visual impression has been created of four 'classical' vases, each with two handles at the neck, being bent through ninety degrees at each of the four corners of the foot. No such eccentricity of design would be correct in the Renaissance, and neither the Chatsworth drawing nor any sixteenth-century design by a court artist is known to include such a strange detail. (iii) On the upper surface of the square foot (as depicted in the drawing) two of the white enamelled masks with beards are clearly depicted, but the rest of the upper surface of the square foot is left plain - unlike the gold version, where the space between the applied masks is filled with a translucent enamelled vine scroll along each of the four sides. (iv) On the circular stem (as depicted in the drawing) the white egg-like bosses are each decorated with four separate dots of gold (arranged in a diamond pattern) - unlike those on the stem of the Waddesdon Bequest vase, which are each ornamented with a four-lobed gold rosette. (v) On the neck (as depicted in the drawing) the four roundels (with white rivet heads) are flesh-coloured (not a bright red as on the vase) and the swags of drapery are white (not the vivid deep blue of those on the vase); above, the bold arabesque design is painted in blue on a light ground (not white on a black ground, as on the Waddesdon Bequest vase). (vi) Finally, the rim-mount (as depicted in the drawing) projects outwards even further and its upper convex surface is less rounded than on the vase itself. Certainly, the two profiles are distinctly not the same. The above list of very precise differences has been compiled because none of them can be convincingly dismissed as the simple errors of an incompetent seventeenth-century artist of inferior calibre. Furthermore, all these differences - apart from the colours on the neck - are to be found repeated in a second drawing of the vase. Unfortunately, this second drawing had no history before 1885 when it was purchased, along with a collection of some fifty miscellaneous drawings, from an unnamed dealer by the Victoria and Albert Museum (inv. no. D. 64-’85; see P. Ward-Jackson, ‘Victoria and Albert Museum Catalogues: Italian Drawings Vol. I: 14th—16th Centuries’, London, 1979, no. 495, where it was not recognised as relating to the drawing at Chatsworth nor to the vase in the Waddesdon Bequest; it is, however, stated to be “a design for a vase and cover decorated with grapes and vine leaves. Pen and ink with gold paint and blue watercolour on the base and cover”). Its identification as 'a design' and its attribution to a sixteenth-century Italian workshop are wholly unconvincing, especially as the draughtsmanship is greatly inferior to that of the Chatsworth 'inventory-type' drawing. For example, on the London drawing the vine branch on the right-hand side of the body, the rams' heads around the cagework element and the relief on the cover are particularly incompetent. Inexplicably, the oval niche on the square foot has been carefully drawn in a less elongated form - with a corresponding adjustment to the Bacchus figure, which is less reclining - than on the Chatsworth drawing. However, all the other details on the foot are exactly repeated, but, curiously, the neat effect has been marred by a later hand crudely drawing two additions on either side of the square foot, as if experimenting with the idea of enlarging the foot by 'half a space' on either side. The age, origin and purpose of this drawing, therefore, remains uncertain, although it certainly possesses all the characteristics of a drawing of a finished object, aiming to record the most prominent features in detail - albeit with less skill than in the drawing inscribed ‘Agathe Oriental’. Consequently, there is no new information that does not corroborate the evidence of the Chatsworth drawing and reinforce the conclusion that the enamelled gold mounts on the Waddesdon Bequest vase are not those depicted and, therefore, must be of more recent origin - an interpretation that agrees with the results of the recent physical examination of the dismembered mounts. If the mounts are not original, what evidence is there for attributing the carved agate two-handled body to a workshop in the late Roman period? In 1897 only one of the five Devonshire pieces lent to the Burlington Fine Arts Club Exhibition was thought to be 'ancient' - the lapis-lazuli vase (WB.70), which was described as “probably late Roman of about the second century”, although the lapis-lazuli cover was stated to be “Italian, 16th century, surmounted by a small figure . . .”. The identical ascription, “Italian, 16th century”, was bestowed in 1897 on this two-handled agate vase but was decisively abandoned by Charles Hercules Read within a year of Baron Ferdinand's death. His new attribution can be found in a little-known paperback handlist of the Waddesdon Bequest, which is very prominently marked ‘UNDER REVISION’, both on the cover and on the title-page, and has an Introduction (pp. v-xii) bearing his signature and the date “December 1899”; in it, he states “. . . one piece stands pre-eminent - the mottled agate vase (no. 68, pl. IV), of which the body is an example of ancient Roman cameo work ... it is somewhat rare to find an ancient vase of hardstone so symmetrical and graceful in outline and it is probably this quality that led the goldsmith of the Renaissance to bestow his skill upon it” (see ‘The Waddesdon Bequest, The Collection of Jewels, Plate and other Works of Art bequeathed to the British Museum by Baron Ferdinand Rothschild, M.P.’, London, 1899, p. vi). This passage was, indeed, revised to read: “The only other relic of classical times is the agate cameo vase (no. 68), which may be assigned to imperial Rome . . .” (Read 1902, p. x). Apart from three similarly worded versions (Davenport 1900, Strong 1909 and Dalton 1927), Read's belief in the classical origins of the carving on the agate body appears not to have received careful consideration until 1943, when Marvin Ross included the vase in a list of extant “antique agate vases, either whole or in a fragmentary state” (Ross 1943, p. 30, fn. 118). Furthermore, Ross stated that “of these, only one, the Waddesdon Vase in the British Museum, seems to have any relation to the Rubens Vase . . .” and he illustrated it on page 33 in fig. 17. Ross proceeded to relate it to a vase in Vienna (see A. Furtwangler, ‘Die Antiken Gemmen’, III, Berlin, 1900, p. 341, figs 192-3) and to a silver repoussé case enclosing a glass phial in Baltimore (Walters Art Gallery, inv. no. 57,932 ; H. 9.5 cm); he tentatively concluded that these “comparisons seem to indicate that this vase belongs with late Roman gem carvings, in which case it precedes the Rubens Vase in date and represents a type from which the latter derived”. For the Rubens Vase Ross succeeded, where previously there had been disagreement among scholars, in marshalling “convincing arguments against an early- or late-Renaissance dating of the piece and in favour of placing it in the fourth or fifth century of our era” (Harden and Toynbee 1959, p. 202, pl. LXXIV). These two classical scholars not only illustrated the Rubens Vase but also included a photograph of the Waddesdon Vase, about which they stated “the design is tamer and the undercutting of the ornament less daring. It may well be somewhat earlier than the Rubens Vase and is technically less close than is the latter to the figured glass cage-cups” (Harden and Toynbee 1959, p. 202, pl. LXXV, a, b). The other recent major publication, also by a classical scholar, lists it as the 'Waddesdon Vase' and places it immediately before the Rubens Vase, which is dated to the end of the fourth or beginning of the fifth century AD (see Bühler 1973, pp. 76-7, nos 108-9, pls 36-7). Furthermore, Bühler compares the carving of the acanthus leaves on the Rubens Vase with those on the Waddesdon Vase, and for the form of the latter he refers to a piece in Rome (discussed in G. Lippold, ‘Die Sculpturen des Vaticanischen Museums’, III, 2, Berlin, 1956, p. 236, no. 84, pl. 115); however, the latter is a more typical classical oviform vase (without handles) and lacks the unusual elongated shape of the Waddesdon Vase. For certain details of the carving, especially the drilling of small dots, he cited the unprovenanced chalcedony fragment with a leaping panther amidst foliage from the Townley Collection (British Museum, Department of Greek and Roman Antiquities; see Bühler 1973, p. 77, no. no, where the fragment (H. 4 cm) is dated “4-5 Jahrhundert n. Chr.”; also, see H. B. Walters, ‘Catalogue of the engraved gems and cameos, Greek, Etruscan and Roman, in the British Museum’, London, 1926, p. 375, no. 4052, fig. 115 (a line-drawing), but there is no reference in this entry -nor, indeed, elsewhere in the volume - to the Waddesdon Bequest's “antique Roman” two-handled agate vase). In conclusion, Read's initial description of the carved agate body as a Roman antiquity - unsupported by sound art-historical argument - has gradually been endorsed by classical scholars, despite the lack of any mention of it by Walters in 1926. However, in the absence of a well-researched case, comparable with that advanced in respect of the Rubens Vase (see Ross 1943, pp. 9-39; D. Alcouffe, Gemmes Anciennes dans les Collections de Charles V et des ses Frères, ‘Bulletin Monumental’, vol. 131, pl. 1, Paris, 1973, pp. 41-6, fig. 1; also Alcouffe 1984, p. 85, fig. 2e), the Roman origin of the Waddesdon Vase will remain less securely established than that of the Rubens Vase, which, for all the superficial similarity of its decorative motifs, is otherwise very different. As expressed in Marvin Ross's commentary on the Waddesdon Vase (Ross 1943, p. 31), “not only its proportions, but the whole spirit of the thing is quite different . . . the restrained design shows none of the almost eccentric vigour and the daring undercutting of the Rubens Vase”. One might add that the truly sculptural quality of the Pan-head handles on the Rubens Vase is immeasurably superior to the carving of the heads on the Waddesdon Vase, where the lack of modelling and absence of detail (such as the row of teeth or the locks of hair) is strikingly apparent. Furthermore, as present colleagues in the Department of Greek and Roman Antiquities are quick to point out, little comparable material has survived and so, without adequate data, the necessary criteria for judging the age of the carved agate body of the Waddesdon Vase is still lacking. An understandable reluctance to confirm the vase's reputed origin in the late Roman period will persist unless fresh evidence comes to light.